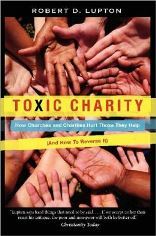 Robert D. Lupton, Toxic Charity: How Churches and Charities Hurt Those They Help. New York: HarperOne, 2012. Toxic Charity captures this divide in writing that is perceptive and prophetic, even if not always persuasive. Lupton tells of the church in Mexico that was painted six times by six groups one summer, the gift-giving program that left the fathers of children feeling emasculated and inadequate, and the tile floor in a Cuban seminary that was inexpertly laid by novice volunteers as skilled local laborers were left without work. Lupton’s criticisms of the billion-dollar charity industry are important, and we should listen to them. His suggestions for transforming ministries are also thought-provoking, as is the “oath for compassionate service” he describes in later chapters. Its principles, in fact, coincide with the ELCA’s method of accompaniment and are vitally important for authentic and effective service. Because of these high points, it is easy to mutter “amen” while reading. Lupton does a great job pointing out the problems of some forms of direct service of the poor. But for a church that also does public advocacy, his book has some remarkable shortcomings. One criticism is that Lupton moves uncritically between uplifting the capacity and creativity of the poor and degrading them as lazy and dishonest. “Most [panhandlers] are scammers,” he states (45). Most poor people in the United States “assume that their subsistence is guaranteed” and so lack any kind of work ethic, he claims (121). I won’t dignify his words with the verb “argues” because Lupton doesn’t argue his points; he simply states them. I would be concerned that statements like this, when coupled with his criticisms of charity, would motivate more people to avoid service work in the first place than to engage in the community development he suggests. His approach to the role of government is particularly troubling, again, given the lack of evidence he marshalls to defend his claims. “As a country,” he writes, “we understand that welfare creates unhealthy dependency [and] erodes the work ethic” (22). This indictment continues in his evaluation of international aid (given to the same people who, according to his own account, have the stronger work ethic that should make such aid effective). The difficulty here is not his rejection or support of foreign aid or welfare. There are arguments to be made on both sides of the debate. The problem is that the only apparent research Lupton draws on is Dambisa Moyo’s controversial 2009 book Dead Aid. Outside of this, Lupton appears to draw on his own experience, which I admit is extensive, but this does not make for a well-defended argument. And this is vitally necessary when making statements about both the poor and government’s relationship to them that are far from self-evident. For example, Lupton claims that “all our efforts to eliminate poverty have succeeded only in creating a permanent underclass, dismantling their family structures, and eroding their ethic of work” (3). Such a premise neglects the arguments that such programs have been woefully underfunded since the 1970s and so may be said to have been set up to fail. There may be structural and systemic reasons why poverty remains a problem. What is more, to blame poverty-elimination efforts for the “breakdown” of the family is a leap that requires defense and explanation. Such statements are common in political rhetoric, but if they are to influence churches (as Lupton desires) there at least should be some evidence demonstrating their truth. That said, I still cautiously recommend the book. Clearly, Lupton touches a nerve when it comes to how the “haves” respond to the “have-nots.” And the similarities between his recommendations and the ELCA’s model of accompaniment create points of entry for talking and thinking about how we live faithfully in the midst of a complex world, where even our highest ideals fall short. Perhaps it may also be an occasion for drawing out some of these complexities in ways that Lupton ignores. If your congregation or group is looking to do service on the frontlines or planning a mission trip, I strongly recommend Lupton’s book. But if your group is dealing with public policy issues or advocacy, I would suggest also looking at Sasha Abramsky’s The American Way of Poverty: How the Other Half Still Lives (reviewed here last month) or David Beckmann and Arthur Simon’s Grace at the Table: Ending Hunger in God’s World to balance Lupton’s claims.